That’s right boys and girls, after talking about it for a month and a while I actually did make danish. The cute little ones that are spiraly with delicious things in the middle. I made cherry ones. Nom? The glaze woulda been better with a little orange blossom water in it though. That’s my secret to all of you. Orange blossom water, just a touch, will make icing sugar glazes taste out of this freaking world. DOITUP YO. 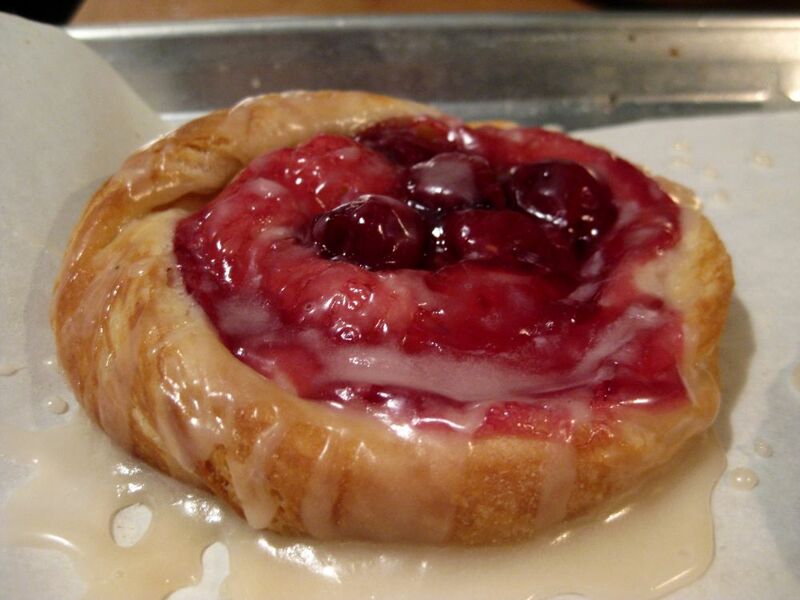 I love making danish dough because it’s just a really nice dough to work with. He’s not a jerk, isn’t incredibly tempermental, tells me jokes and he’s very smooth to touch. Sometimes I want to rub my face on it, but that wouldn’t be very hygenic and apparently that’s something that people would freak out about. I just don’t think my face is that dirty guys. Anyways, so I went and got some fresh yeast to make this. Now I have a pound of fresh yeast in my fridge and need to use it up. I forsee soft pretzels in the future, yeasted coffee cake, and maybe brioche so I can make some wicked awesome french toast whenever I buy maple syrup. I might even go so far as to make this bread that is swirled up with CHEESE BACON AND CHICKEN!!! Ya for real, I think I really really need to do that. Also maybe more maple bacon doughnuts because they’re awesomely delicious. This entry was posted in Delicious Breakfast Things, Yeasty Deliciousness. Bookmark the permalink.